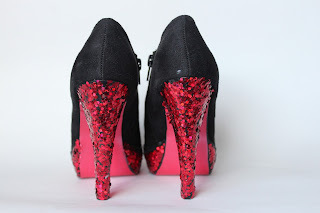 Theresa Joy : 365 Days of Pinterest Day 4 ~ DIY Glitter Pumps! 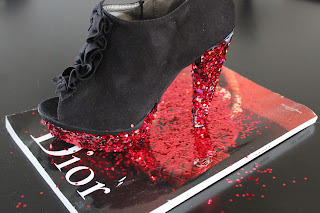 Day four of my 365 days of Pinterest .. Iv chosen the DIY sparkle pump pin ... 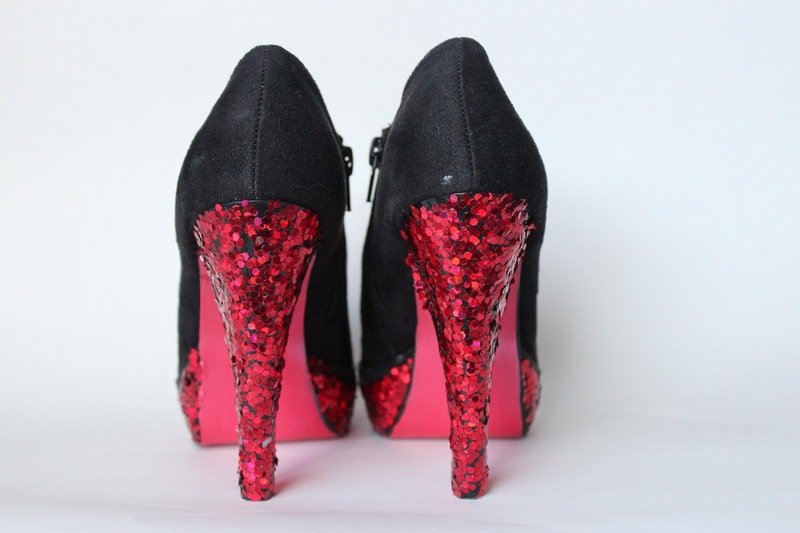 Original Pin ..
Start with a pair of previously luved pumps ... 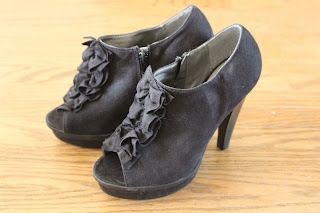 I chooe these velvety open toe booties. Rub down the areas you will be working on with alcohol. I wiped off the heel, bottom of the shoe and toe. This will prep the area for glue and paint. Use your hockey tape to tape around the areas you will be glitter - iffying. You dont want the glue and glitter to creep outside of the area you are working on. Alot of DIY's call for painters tape, but it doesn't stick and mold well to the shoe. 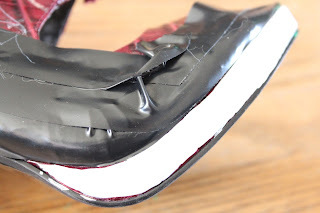 Electrical tape will damage your shoe. The hockey tape is perfect. It gets into each crack and curve. You can purchase this at Walmart, Target ect or sports stores . .$2 - $5. Mod Podg the areas you will be glitter- iffying (you can use gem tack or craft glue as well, just add a little water to thin it out). 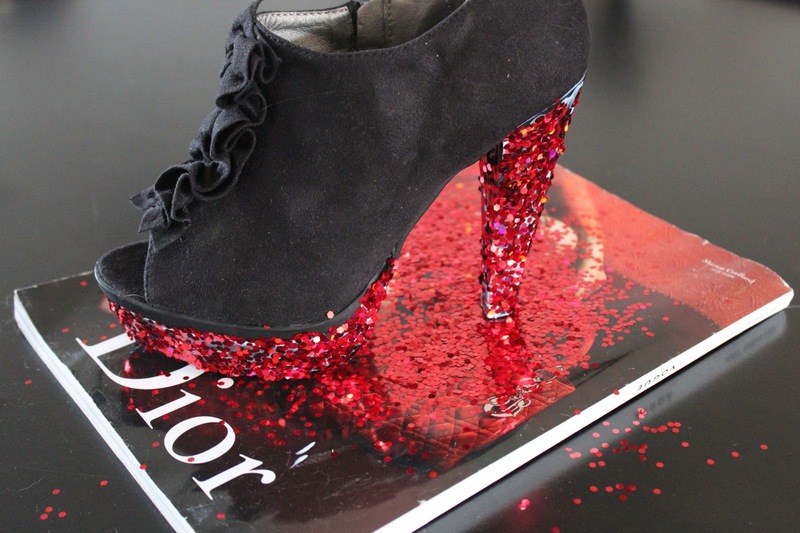 I applied the glue with a paint brush to the heels and toes. 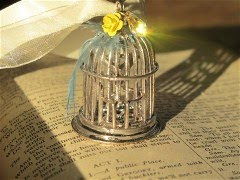 Glitter away ... I used Martha Stewarts Iridescent Hexagon Glitter ... 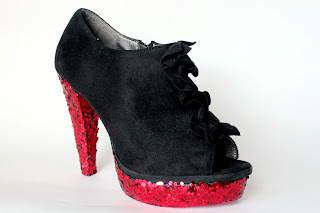 I know most DIY's call for 'fine' glitter but I wanted the chunky disco ball look. Tip; use the 40% off coupon for Micheal's Craft Store. You can find it in their online flyer and print it off or bring your Iphone ... glitter is $26+ for the 12 pack. But its GORGEOUS ... other then that my dollar store has great 'fine' glitter ..
Let the glitter dry (1 hour) and re touch any areas that seem sparse. Now you are ready to seal it all in. I use indoor / outdoor gloss sealer because it is water repellent You can purchase this at Walmart or a Craft store. Cover your glitter and paint with this sealer. I did 2 coats. Let it dry 24 hours before you wear them around. Remove your tape and wa laaaaa. 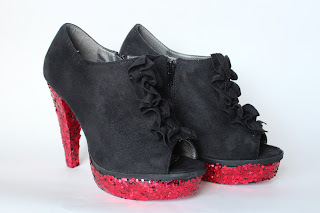 if you like these booties you can purchase them here ..